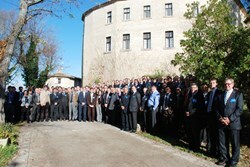 More than 120 representatives from European industry participated in the meeting. Last Monday, 22 November, the European ITER Domestic Agency Fusion for Energy (F4E) hosted an information meeting in Cadarache regarding the procurement packages for the construction of the ITER buildings. As well as finding out more about the general project strategy, getting an overview of the planning and the procurement procedures and learning more about the buildings construction allotment strategy, the 120 participants who came from various industrial companies and from eleven different European countries had the opportunity to have short face-to-face meetings with the F4E technical and procurement teams and the possibility to develop B2B contacts to form potential consortia and increase the possibilities of subcontracting. Tim Watson, head of the ITER Directorate for Tokamak Complex Civil Construction and Site Support, said that the construction activity now evident on the ITER site provides a visible measure of the significant progress of the project. He also stressed the significance of delivering the different buildings on schedule as uncompleted buildings would delay the assembling of the machine. F4E's head of Contracts & Procurement, Philippe Corréa, and Chief Engineer Maurizio Gasparotto then highlighted the progress achieved by F4E: over EUR 1 billion worth of contracts have been already awarded in the European market and successful technical development of the vacuum vessel and the divertor has been carried out.